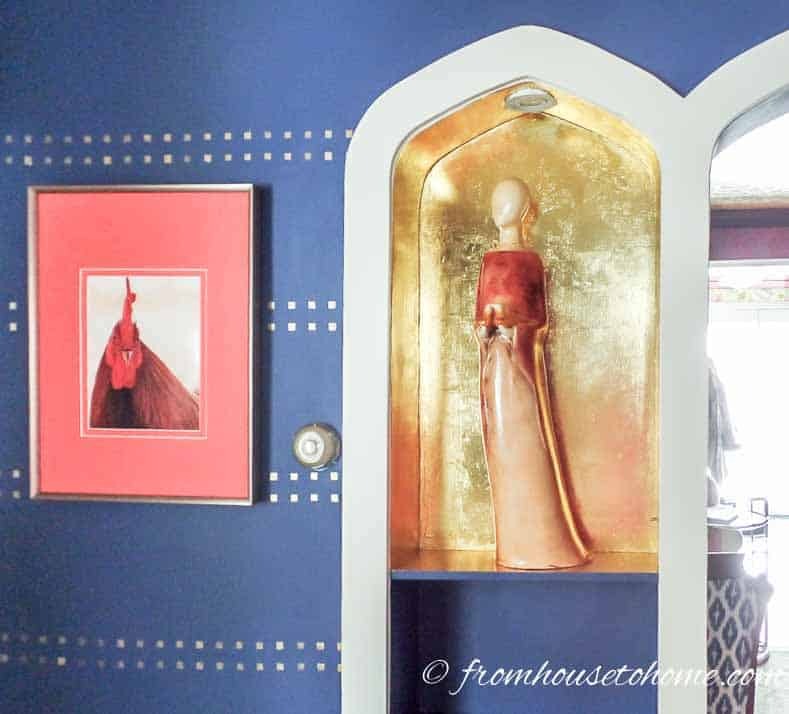 If you love that old Hollywood decorating style like I do, these glamorous decorating ideas are for you! 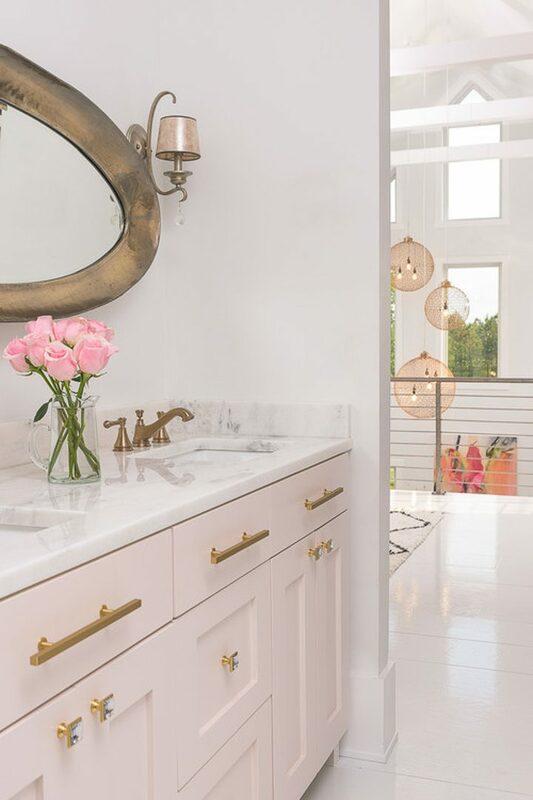 I was able to makeover my builder grade home using these ways to add glamour to your home (plus some ideas for making your home look more expensive), and recreated the look of Hollywood glam on a budget. If you’ve been around here for a while, you won’t be shocked to hear that I like a little glam decor in my life. In fact, I may like it more than a little. I call my personalized design style Eclectic Deco Glam…so it’s right there in the title! I love that nod to old Hollywood glamour interior design. However, since I live in a new-build builder grade home and not a Hollywood Hills mansion, my house didn’t have anything close to luxury and glamour when I first moved in. I had to do some work to add Hollywood glam decor to my home, especially since I was on a budget. But now that I’ve “glammed up” quite a few rooms in my house, I can say with confidence that it can be done. And it doesn’t have to be difficult or expensive. 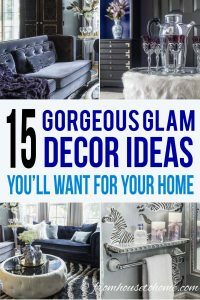 So here is my list of 15 easy glamorous decorating ideas that will help to add glamour to your home. 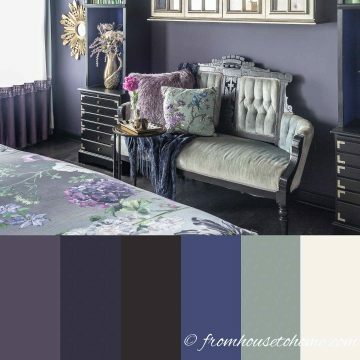 You can easily add glamour to any space by using rich looking fabrics like silk and velvet, along with trims. Despite its plush appearance, velvet is actually quite durable. If you have cats (like I do), it is one of the best furniture fabrics out there. It absolutely does not get pulls from their claws. And although cat fur does stick to the velvet, it’s very easy to wipe off using a pet brush (the kind that you use to brush your dog or cat). 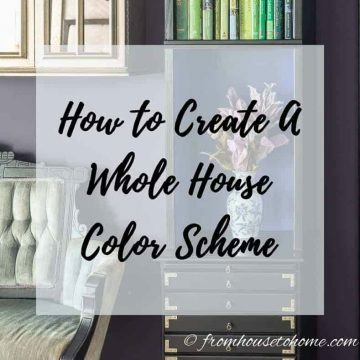 However, if you don’t want to go all out for a new piece of furniture, a few cushions in a luxurious fabric or adding some trim on your curtains will add to your glamorous interior design. 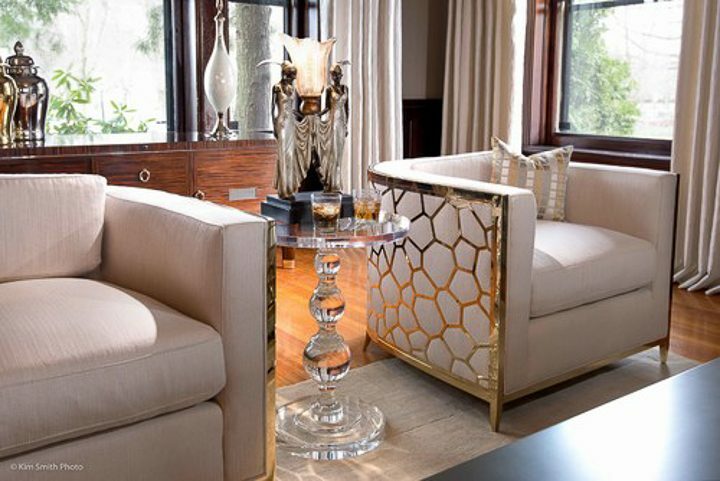 Metallic finishes like chrome and gold are another way to add glamour to your home. These can be smaller pieces like this inexpensive brass vase. Or spray painting some corner braces gold and screwing them on to the front of your bedside tables. 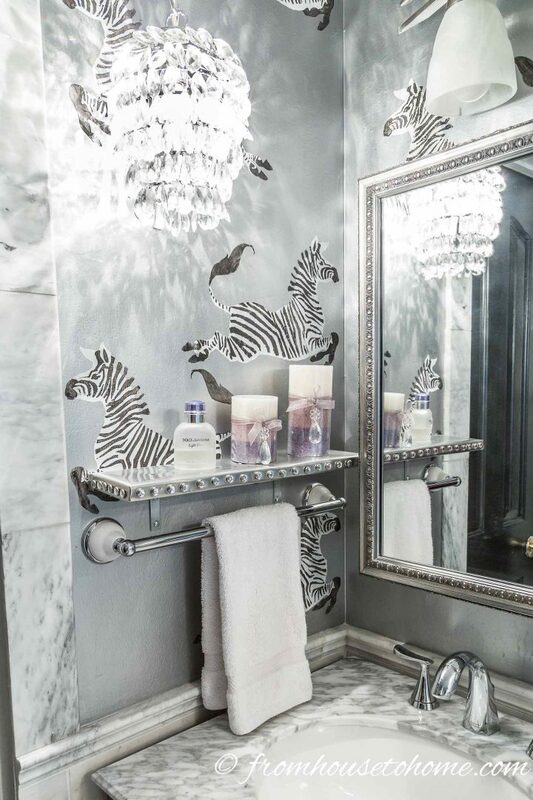 Of course, if you want to go all out, you can paint your walls silver and stencil on some zebras like I did in my Hollywood glam master bathroom makeover. Using tables and chairs that are clear adds an element of glamour to any room. The clear surface creates some sparkle without taking up any visual area. Which is also great for making small rooms seem larger. Or for some Hollywood glam decor on a budget, add a single flower stem to a small crystal vase. 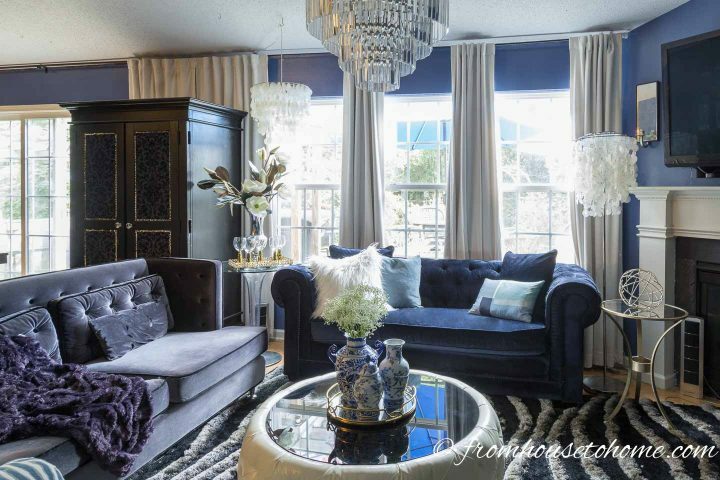 It adds a pop of color and glamour at the same time. The next one of my glamorous decorating ideas is to add romantic lighting. I think this is the single most important element in making a room feel luxurious. It’s hard to make any space feel right if it doesn’t have the right lighting. Chandeliers, pendants, sconces and beautiful table lamps all work well because they bring the light down into the room. 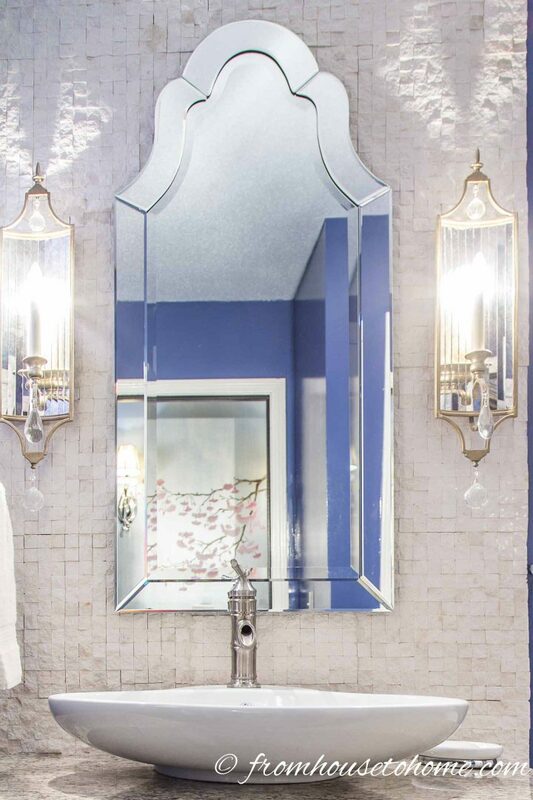 Light fixtures with crystals will help to disperse the light around the room giving everything a softer look. Which is why I have replaced every builder grade light fixture that came with my house. Try to avoid overhead lights that cast harsh, unflattering shadows. They don’t make anyone (or room) look good. 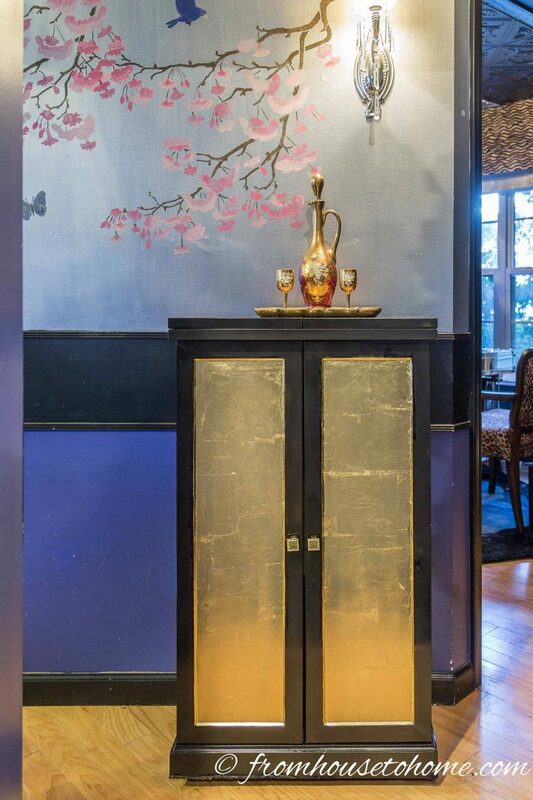 Gilded finishes on furniture, walls or ceilings can instantly make a room feel special. And doing it yourself is really not as hard as it seems. 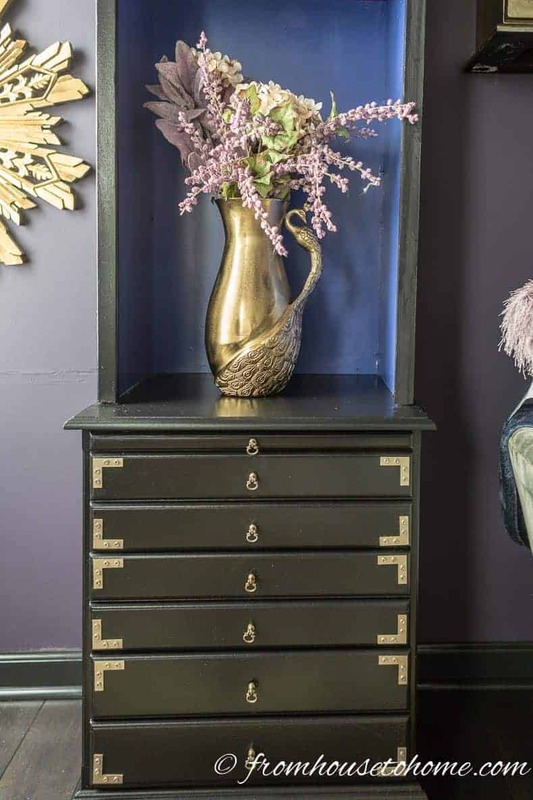 (Find our tutorial on how to add gold leaf to furniture HERE). It only took a couple of hours for me to turn my fold-up bar into a Hollywood glam piece of furniture using gold leaf. And my mother did a similar technique on the focal point wall in her living room makeover. 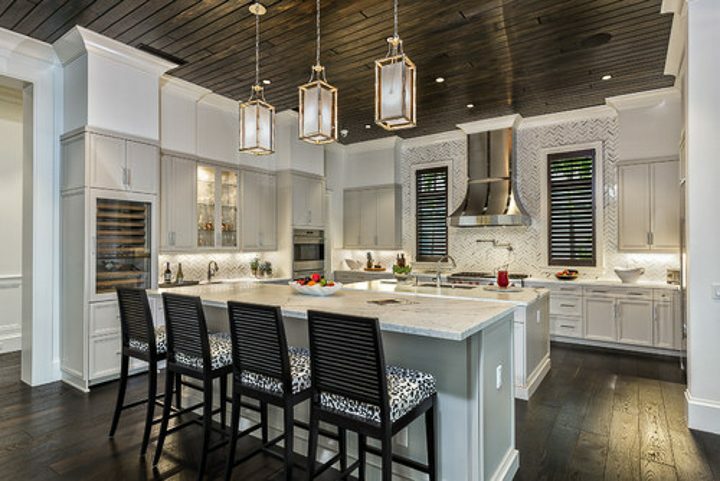 Traditional Kitchen – Photo by Joey Leicht Design Inc.
Mirrors reflect light that helps to add some sparkle and glamour to your room. But they make even more of an impact if they are part of a piece of furniture like the doors on this armoire. Venetian style mirrors that have decorative frames also made of mirror are another way of adding some glam to your room. I like to use them in unexpected places like over the sink in my guest bathroom. Of course, adding a glam metallic frame also works quite well. 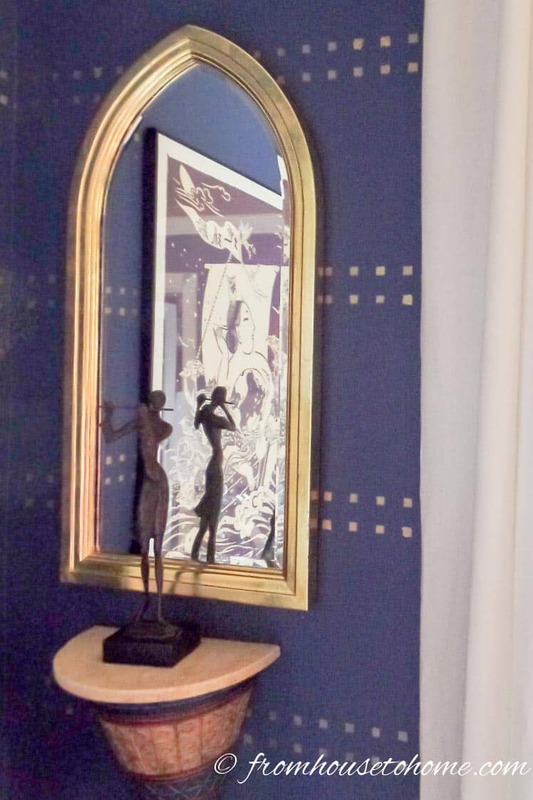 (My mother used gold leaf on a standard framed mirror to add some glam to this look). 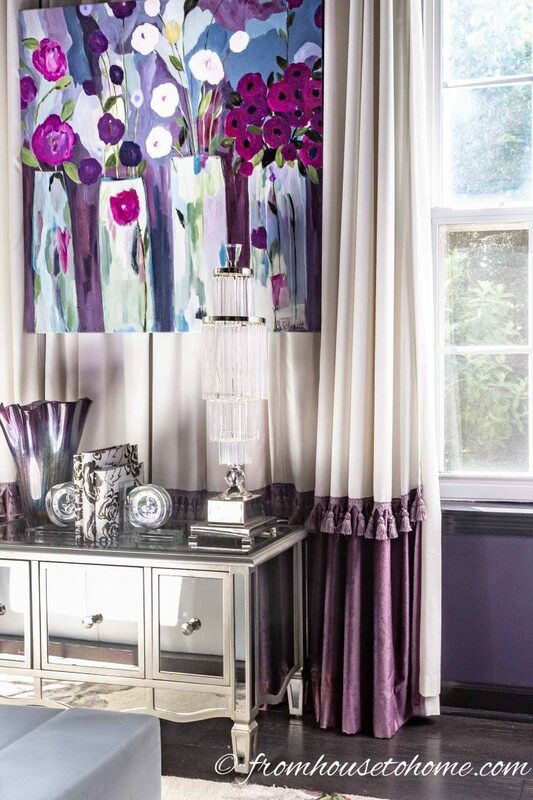 Adding statement curtains to your windows brings some interest and glamour up on to the walls. I did this in a fairly subtle way, by hanging white velvet drapes in my living room. The contrast with the blue paint really makes them stand out. Hanging them all the way at the ceiling (rather than just above the window) also adds to the drama. 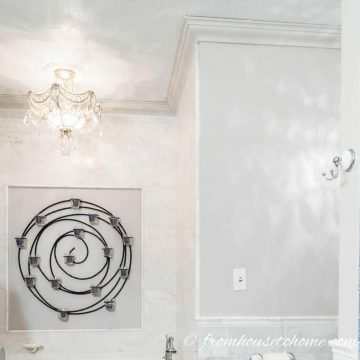 Note: This image cannot be pinned due to houzz.com restrictions. But if you really want to make a statement, these gorgeous drapes definitely have that old Hollywood luxury feel. Covering wood or tile floors with plush area rugs provides a texture difference between the smooth flooring and the rich-looking carpet. And those thick area rugs feel so nice under your feet, which definitely helps to add the feeling of luxury. 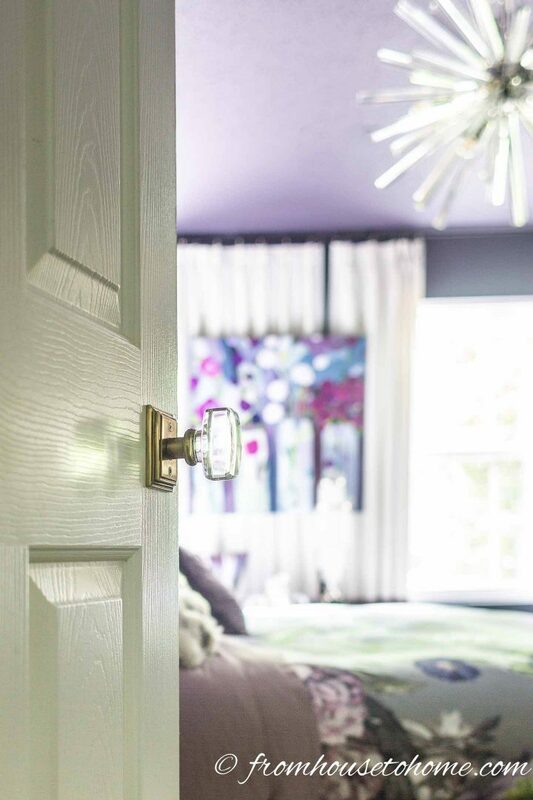 Upgrading knobs and pulls is another really easy and fairly inexpensive way to give your home that glam look. It’s amazing how changing out the door knobs to my bedroom makes me feel like I’m walking into luxury before I even open the door. 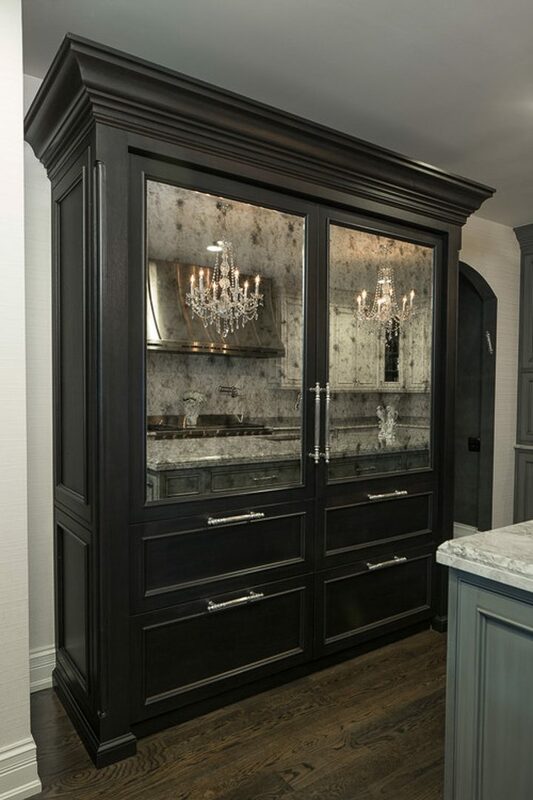 You can get the same effect by upgrading kitchen cabinet pulls and armoire knobs as well. 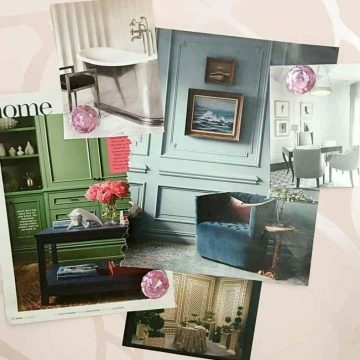 Using nail head trim on your furniture is another easy way to add glamour to your home. Of course, you can buy furniture that comes with nail head trim already installed. But you can also do a DIY project to add it to some of your existing furniture, for a lot less money. 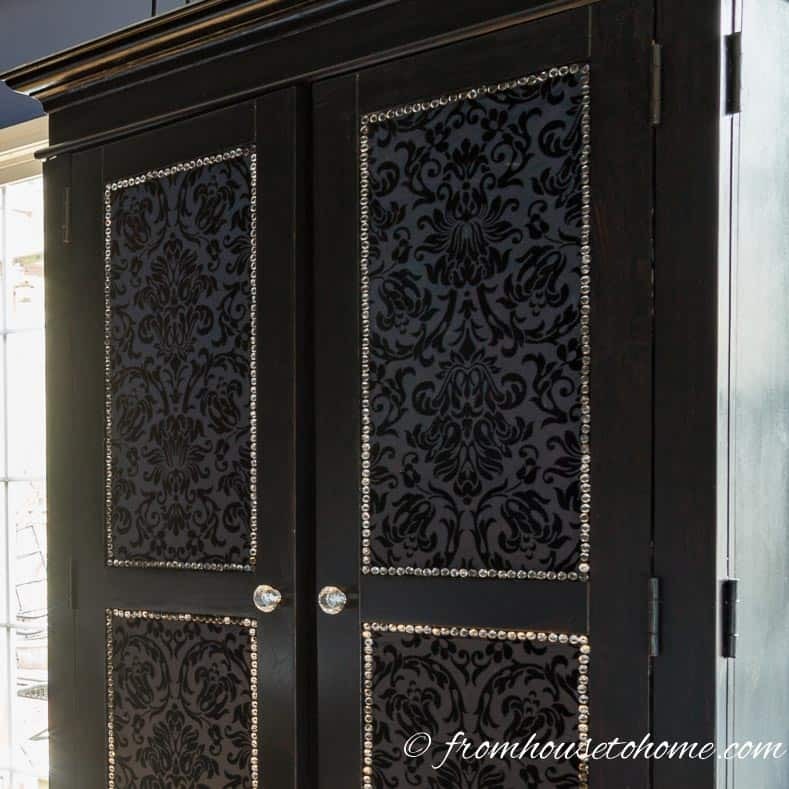 Adding crystal nail head trim to outline the panels in this armoire really added to the glam factor. And that same nail head trim also looks pretty decorating the edges of this DIY bathroom shelf. 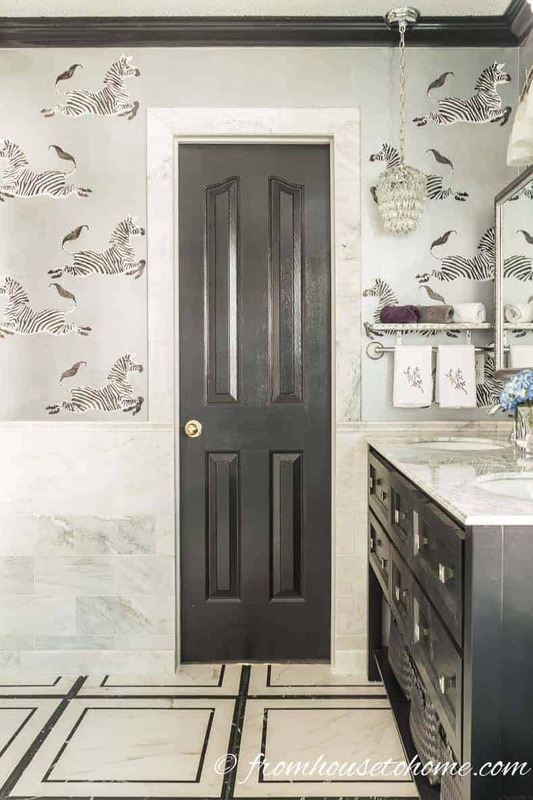 Animal prints, like zebra or leopard, add some unexpected pattern to your space which can help to increase the glam factor. You don’t need a lot of it to make a big impact, like these leopard print chair cushions. 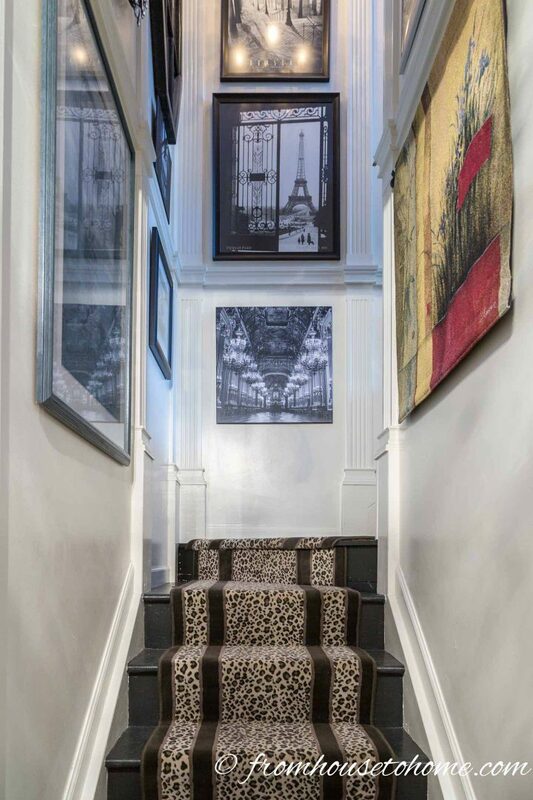 While adding this leopard print runner during my stairway makeover helped to create some interest, and is one of my favorite glamorous decorating ideas in my house. Marble has a timeless, classic feel that also adds glamour to a room. The standard way to add marble is to use it for a countertop in the bathroom or kitchen. 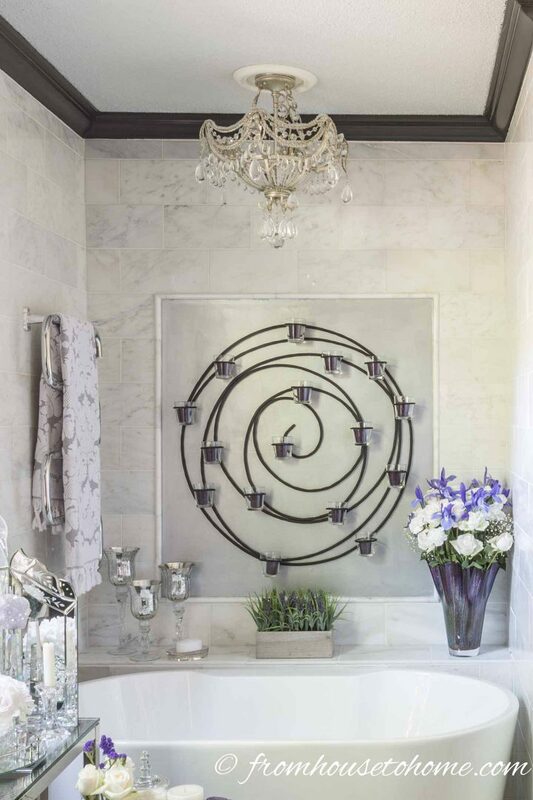 However, you can get a similar feel on a smaller scale for a lot less money by adding some marble accessories. 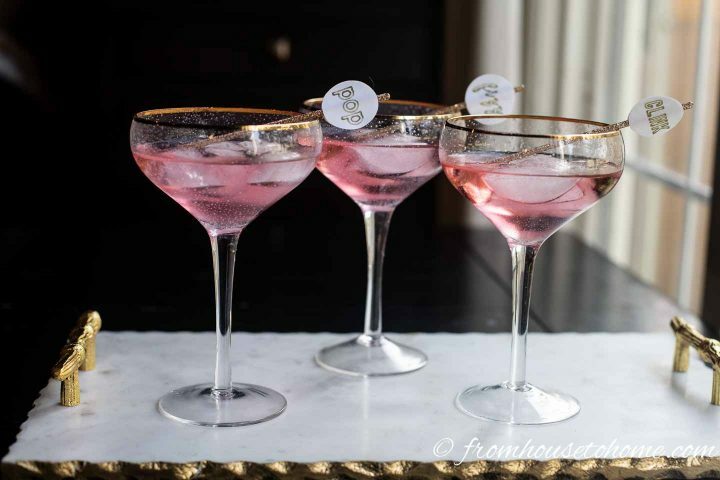 Serving cocktails on a marble tray is an easy way to do the trick. Plus that pink, white and gold color scheme is pretty glam all by itself! 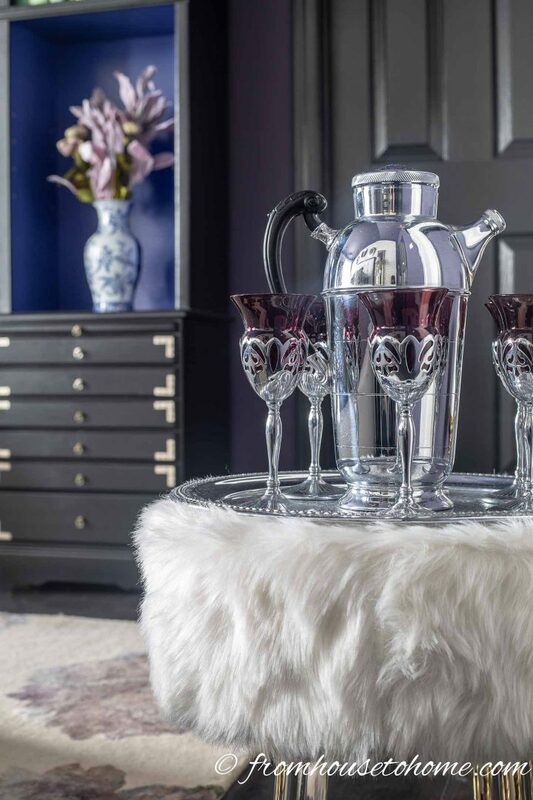 Speaking of cocktails, my image of Hollywood glam isn’t complete without a bar cart…and crystal decanters. Which is why having one in your room is on my list of glamorous decorating ideas. 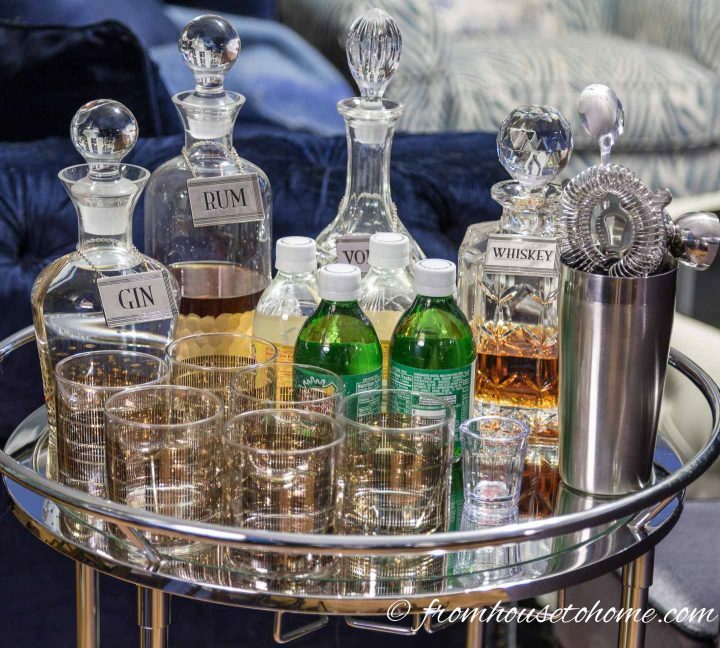 Bar carts are actually very functional pieces of furniture since you can wheel them around to wherever you need them. 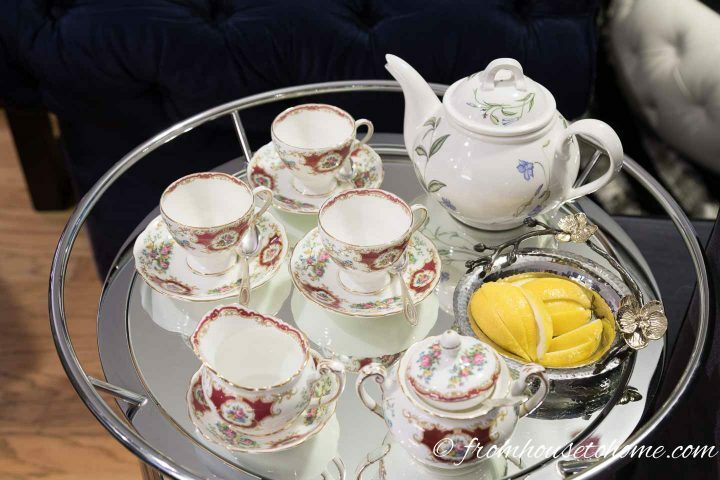 Even if you’re not serving alcohol, they are great for appetizers, coffee and tea, desserts, or anything else that you might need to take out to your guests. 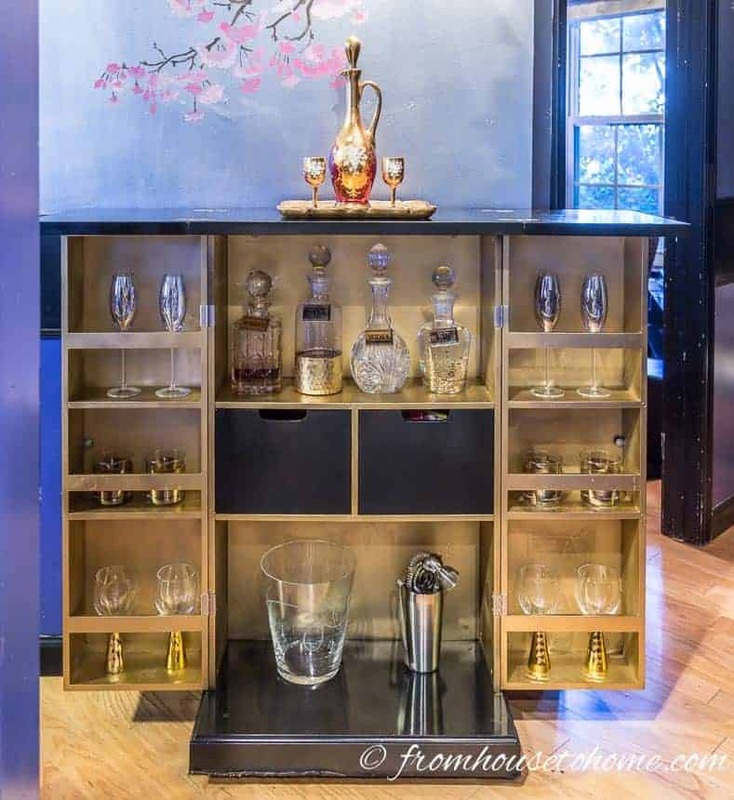 Of course, if you don’t have a bar cart, you can upgrade a shelving unit with some black lacquer and gold paint. After I did that, the inside of my fold out bar looks like a totally new piece of furniture. And I still stocked it with glass decanters. (Find DIY Hollywood bar tutorial HERE). 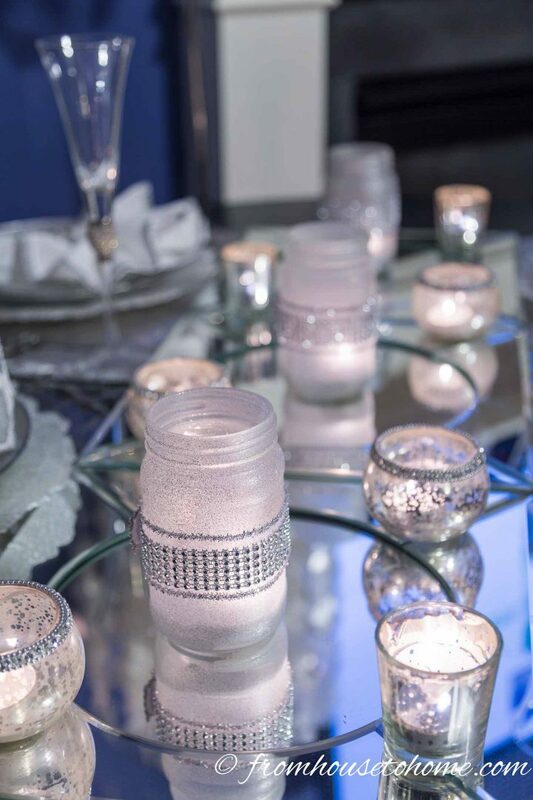 If you’ve seen any of my table settings, you’ll notice that I always use mercury glass candle holders on my tablescapes (like this silver and white table setting). That’s because mercury glass combines two glam finishes together (metallic with glass) to create a super glam product. While you can use it in bigger pieces, like mirrors or cabinet doors, even a little bit of mercury glass (like my candle holders) is enough to increase the glamour in your room. 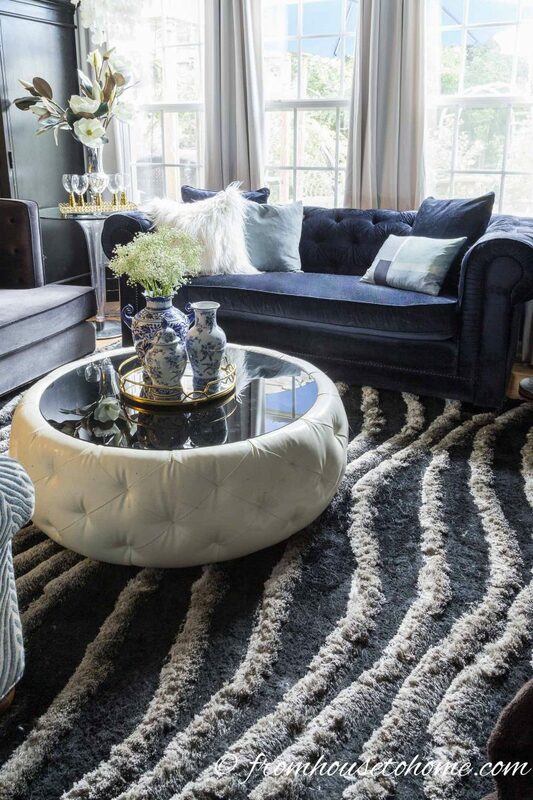 The last of my glamorous decorating ideas is to incorporate some faux fur or sheepskin in your room. 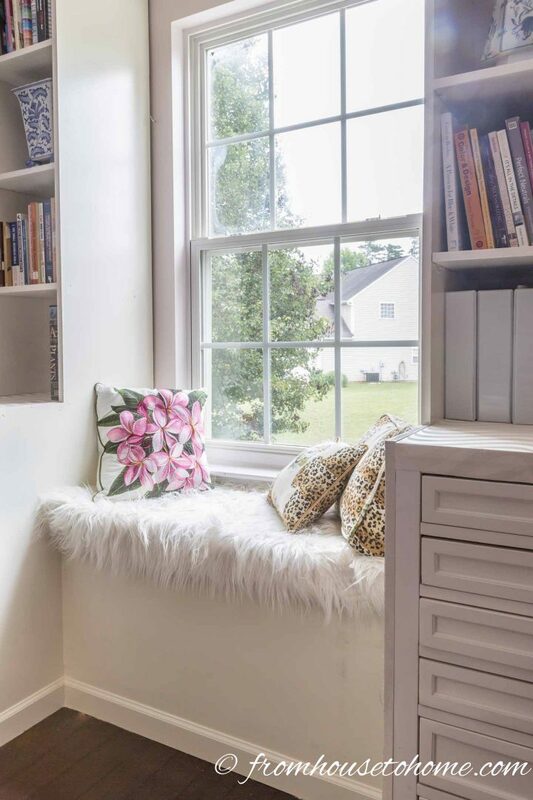 The bookshelves in my bonus room looked like standard shelves until I added the faux fur cushion on the bench. 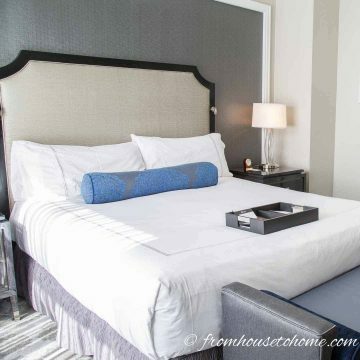 And the faux fur stool in my bedroom definitely makes the room feel like old Hollywood! 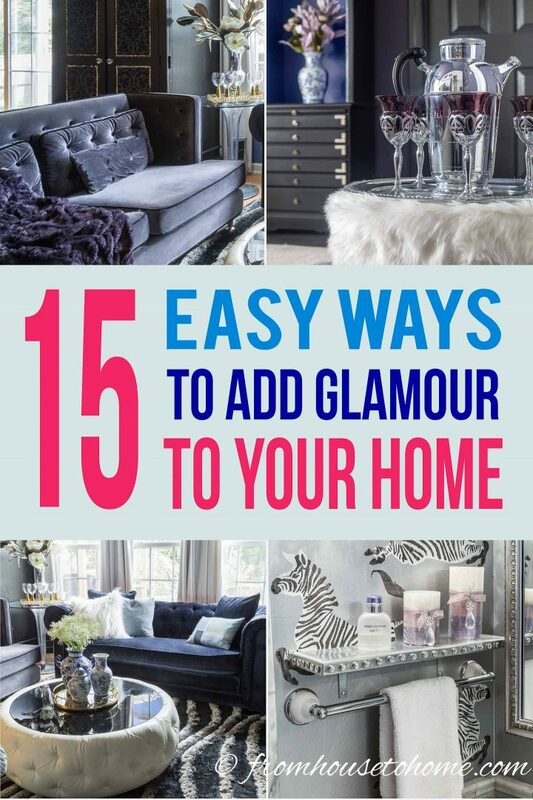 Well, that’s it for my easy glamorous decorating ideas that will add glamour to your home. 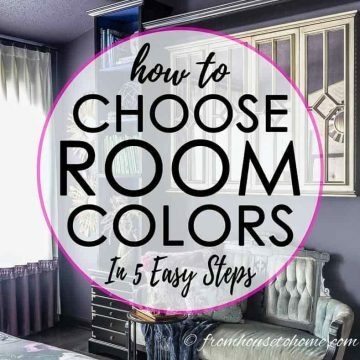 The best part is, you only need to do a couple of these in a room to get that old Hollywood luxury feeling. Have comments or questions on our glamorous decorating ideas? Tell us in the section below.